This is kind of my week at a glance. From the right...Tuesday found me in Cajarc mailing the signed insurance contract for my car along with the yearly premium. I also bought stamps at La Poste. The black folder contains all the paperwork for my car along with the manual for its radio/CD player. You see, the radio requires a code to activate it, and of course, I don't have the code. So, papers in hand I went back to the garage where I bought the car and managed to find enough French to ask if they had the code. Stephane worked magic on the Internet, found it, and even programmed it into my radio. 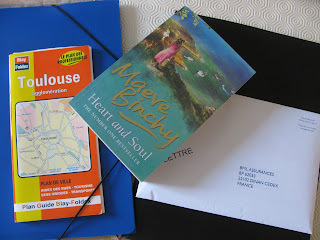 Wednesday...I'll take the Maeve Binchy book back up to the library and see if they have anything else in English I might like to read. The English shelf only has about 10 books, and I've already read half of them! I also made a trip back to Cajarc this morning to retrieve the radio manual that I left at the garage yesterday. Does anyone know how to say 'Duh!' in French?? Thursday...while you're eating turkey dinner with friends and family, I'll be in Toulouse for my visa appointment with the Office of Immigration. Seems really funny to have an appointment scheduled on Thanksgiving day. Hopefully, I'll be able to find this place. The blue folder contains all my visa paperwork and also a folder I call my "proof that I exist" folder. In France, every official transaction from opening a bank account to registering your car to getting your visa requires that you prove you exist! While they want to see your passport or your carte d'identite if you're French, les fontionaires also want proof that you exist in the real world. This requires that you show them a rent receipt, a purchase contract for your house, your electric bill or your phone bill. I keep all this together in a folder, so I can take it with me when I do anything official. If you're a homeless person, does this mean you don't exist in France? Kind of makes you think, huh? Friday...if I have the energy after living in French all week, I may make something 'turkey' just because. I've never seen turkey on a restaurant menu, but it's quite popular in France and there is lots on offer at the grocery store. Not whole birds, tho. Mostly rolled breast meat to roast and legs. I think a nice roast with shallots and maybe a potato/cauliflower gratin? Not exactly a traditional American Thanksgiving dinner, but as close as I'll come this year. Well done! It can be a daunting process to be "legal" in France. A couple of days ago, I went to the local Mairie to get my renewed Titre de Séjour. Much to my surprise I was asked if I had my tax stamps. Tax stamps? Noooo. This is at least my fourth renewal (I lose track) and the renewals have never cost anything. This year Oh contraire mon frère. So off I went to the tax office in Apt to get my stamps worth 85€. Ah, the price of being legal in France. Obviously, we think it's well worth the cost in both energy and money.